The fastest M.2-based drive weve tested. The fastest M.2-based drive we’ve tested; certainly the fastest 256GB consumer drive around; bootable with the right mobo. Still expensive for a 256GB drive (though it’s only $40 more than its predecessor); tricky to find without buying it pre-installed; not an NVMe drive. This article was published in the July 2015 issue of Maximum PC. For more trusted reviews and feature stories, subscribe here. 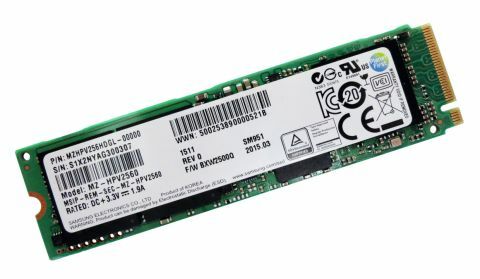 A little while back, we got our hands on Samsung’s 512GB XP941 M.2 PCIe SSD—a rare creature in the wild, but one worth tracking down for its stunning performance. Well, stunning that is, if you could run it at its full x4 PCIe speed. But now we have our hands on its successor, the slightly easier-to-obtain SM951. This M.2 drive first saw the light of day at Samsung’s annual shindig, the SSD Global Summit, which took place, in South Korea, last July. When it was first announced, the company claimed it would be the world’s first NVMe SSD for the PC, but that idea got kicked out of the window by the powers that be, as the drive only supports the good old AHCI architecture. (Samsung has just announced it’s started mass production of the NVMe version of the drive, called the SM951-NVMe). Like the XP941, the SM951 is handled by the Korean firm’s OEM branch, which is why getting hold of one without buying a device with it pre-installed is a bit tricky. The drive comes in three capacities, the entry level 128GB, the 256GB drive (our review sample), and the flagship 512GB unit. There’s no 1TB drive, as per the original announcement, and all are the M.2 2280 format (22mm wide, 80mm long). The XP941 used a 3-core Samsung S4LNO53X01 controller with a PCI Express 2.0 x4 interface. The SM941, meanwhile, uses a Samsung S4LN058A01 controller, again a 3-core chip, but with a PCI Express 3.0 x4 interface. So, what does moving from 2.0 to 3.0 PCIe do then? Well, in theory it doubles the bandwidth—you only have to look at the quoted sequential read/write performance figures of the drives to see the advantage of the 3.0 interface. The 256GB XP941 is quoted as up to 1,080MB/s and 800MB/s for read/writes respectively, while the 256MB SM951 surpasses that by some distance with figures of 2,150MB/s reads and 1,200MB/s writes. But while this drive has hugely fast sequential speeds, it remains way off the 3.2GB/s maximum bandwidth of the 3.0 x4 bus. Surprisingly, given what Samsung is doing with 3D-NAND, the SM951 uses old-fashioned 2D planer 10nm class MLC NAND. In all probability, the same 19nm 64Gb MLC NAND used in the XP941. Also added to the SM951 is support for the PCIe L1.2 power state, which can be looked at as the PCIe equivalent of DevSleep that’s supported by some standard SSDs. Another advantage of the SM951 over the previous model is that it’s bootable (with the right motherboard that is), so make sure you do your homework before buying either drive or motherboard. To test the drive at its full x4 PCIe potential, we used an Asrock Z97 Extreme6, one of the few Z97 boards that can run these drives at full speed, thanks to its extra M.2 x4 port. Alternatively, there’s Intel’s X99 chipset, or you could use an adapter card, such as the Lycom DT-120. It takes some believing, but even the quoted figures for the sequential reads seemed conservative when the SM951 was tested with the ATTO benchmark, the drive producing a score of 2,253MB/s. However, the write performance was bang on the money at 1,272MB/s. When it comes to handling the small 4K files of everyday use, the SM951 shows once again the advantage of the extra bandwidth available to it with a read speed of 44.59MB/s, in the AS SSD 4K test, compared to the XP941, but the biggest improvement comes in the write figures. The XP941 gave up a score of 73.05MB/s, totally eclipsed by the 132.31MB/s produced by the SM951. These figures add up to make the SM951 an incredible SSD. In fact, the only thing holding us back is the promise of the imminent NVMe version.